When I ask my students what they or their parents typically make for supper, I get a lot of similar responses. Most tell me they make, and or eat, whatever is easy, comes out of a box, comes out of the freezer, can be made in the microwave or picked up from a fast food restaurant on the way home. It’s so sad that convenience foods are so heavily relied on instead of actually preparing foods from scratch. This is one of the reasons I like teaching about casseroles! Not only are they easy to make, include a variety of foods and nutrients, but they can be made in advance, put in the freezer for future meals and convenient and because they get us in the kitchen, reclaiming our cooking skills and using a lot of staple ingredients from the pantry. Way to go casseroles! Play the word association game by writing down the first food that comes to mind with the following words: one dish meal, easy to preparation, convenient, mixed foods, economical. Hang the words on butcher paper around the room and have students circulate and add their words. Look at each and discuss responses. Many of the responses shared included convenience products which were pre-made, processed, and not so nutritious for us even though the food industry has tried to tell us differently. Ask students the following: How many of you actually cook dinner for your family? What do you make? When your parent(s) cook dinner, what do they make? Are they pulling a premade processed meal out of the freezer or making it up from scratch? If they are relying on processed, premade dinners, ask why? Explain that it’s time to “Reclaim our Kitchens”—what does this mean? View this video clip to explain. In class we are going to start reclaiming our kitchens by learning to prepare easy, convenient, economical one-dish meals that fall into the mixed foods category because they use a variety of ingredients. Introducing….the CASSEROLE! To learn more about the casserole, view: Alton Brown’s Good Eats “Casserole Over” (available at Amazon) and complete the guide sheet while viewing. Go over the information after viewing for correctness and to discuss in more detail. Discuss the nutrition contributions of casseroles including MyPlate. To learn more about the parts of a casserole, divide the class into small groups and assign them a part of the casserole (protein, sauce/binder, starch/extender, vegetables, topping). They must create and present a visual (digital or hand generated,using class/internet resources) that includes: Title (part of the casserole), Function of the part and Examples, including pictures. 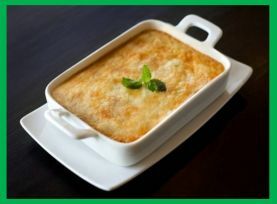 Students will present their visuals to the class and the audience will take notes on each part of the casserole. Students will take their notes from the parts presentation and apply it as they take their favorite casserole recipe and using Google Slides, create a slideshow. On the first slide, your title slide will include the name of the casserole and a picture. On the second slide, type up the ingredients and amounts and on the final slide, create a key of the parts based on your ingredient list. You will present this and the class will practice identifying the parts. Have students brainstorm a list of advantages and disadvantages of making/serving casseroles. Share and create a master list on the board. There are usually a lot more advantages than disadvantages. See the lesson below for examples of each. Now it’s time for a casserole lab. I like to use the activity created by Jyll McNeill from Plymouth High School, Indiana as a creative way to illustrate the possibilities of casseroles. Jyll puts her students into their groups and has them select a strip from each category of casserole parts. She does allow students to trade if they really have an ingredients that just doesn’t work. Students create their recipe, ingredient/shopping list and plan and then meet with her to discuss what they’ve come up with. Students then prepare their casseroles and as they sample their creations, they fill out a taste test evaluation form. As a culminating activity, I like to have my students create a persuasive brochure, using all of their knowledge and resources to encourage individuals and families to “Reclaim their Kitchens” by preparing and serving one dish meals called CASSEROLES! Extension Challenge: I challenged my students to “Reclaim their Kitchens” by actually preparing a casserole at home for their family. They simply had to document the experience with video or pictures, and have family feedback on the meal in addition to the recipe they used. Several students actually took me up on the challenge….love it when they actually apply what we do in school to their home lives!